GoBE believes the best way to end homelessness is to create homes. This is why their mission goes beyond temporary fixes and focuses in on the holistic changes that keep someone in a home and off the streets for good. GoBE partners with the city of LA and many homelessness non-profits that focus on getting our neighbors experiencing homelessness into permanent housing. While their partners do the work of getting the physical apartments and houses lined up, GoBE turns those empty places into homes by providing the essential household items that make life sustainable. For example, what good is a kitchen without dishware and cookware? How helpful is a shower without soap and towels? 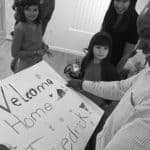 A simple Welcome Home box can turn four empty walls into a home and change someone’s life forever.